Being the naive little girl that I was, I thought that I was getting a new pet parrot, or a cockatoo, perhaps (I was already in the process of picking out names—Polly, Birdie, Betty…). You can probably imagine my confusion and hysteric disappointment as my mom explained that “the bird” was not in reference to a new house pet but instead, the main course of our SUPPER! To say the very least, I did not take this news easily. I put on the waterworks and when dinnertime finally came around, I could not bring myself to eat the turkey—not that year or the 10 years following! I am not kidding, such a simple question had a spiral of effects that put me off to turkey until I was in high school. I had resumed eating other meats (I mean, how long could I possibly go without bacon?! Bacon seems to crack even the toughest of vegetarians), but I was traumatized by my turkey experience. The words, “the bird” haunted me. I finally manned up at age 15, and began eating delicious gravy-soaked turkey again (till this day, consuming obscene amounts to make up for lost time! ), but handling meat still bothered me. I didn’t want to be involved in the process of turning an animal into a plated meal…it just seemed wrong. But, men love meat and women that cook it, so when I finally fell in love sophomore summer of college, I decided it was time to conquer my fear. The very first meat dish that I ever prepared was this Chicken Marsala with baby button mushrooms. I cooked it for my boyfriend at the time and 3 of his friends (spoiled boy…right?). I never disclosed that it was my first attempt at meat, and no one detected that it was either. This flavorful meal is super easy for anyone to make, so I suggest it for any level of cooking experience. I like to pair it with Garlic Roasted Mashed Potatoes and a nice side salad such as Goat Fiesta with Shallot-Thyme Vinaigrette. This is a guaranteed hit among any crowd, and better than any chicken marsala that I have ever ordered out. It is very important that you use the proscuitto though because it gives the dish a hearty flavor and a nice dark brown color. Pound out chicken with flat meat mallet so that it is 1/4 inch thick (I put the chicken in a plastic baggie or between two pieces of plastic wrap to pound out). Cut into desirable sized pieces and then season with salt and pepper. Heat oil in large sauté pan over medium-high flame. Once the oil is nice and hot, dredge chicken in flour, shaking off excess. Slip the cutlets into the pan and allow to cook for 5 minutes on each side until golden brown. (Cut into center to make sure cooked through). Do this in batches until all of the chicken is cooked, and if you need to add more oil to prevent sticking, do so. Place the cooked chicken on a large platter and cover to keep warm. Lower the heat to medium and add the proscuitto to the same pan that the chicken was cooked in. Sauté the proscuitto for 1 minute in the drippings to render out some of the fat. Now, add the mushrooms and thyme and sauté until they are nicely browned and their moisture has evaporated, about 5 minutes; season with salt and pepper. Pour the marsala in the pan and allow the alcohol to boil down for a few minutes. Add the chicken stock and simmer for a minute to reduce the sauce slightly. Stir in the butter and return the chicken to the pan. Simmer gently to warm the chicken and then serve. Garnish with parsley if desired! This sounds absolutely delicious. 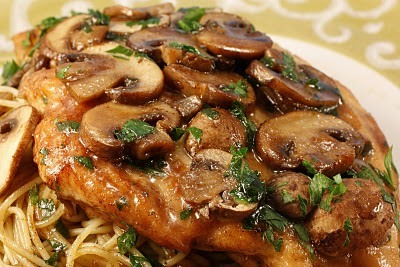 I’ll be cooking Chicken Marsala next weekend and this is the recipe I’ll be using. Thanks for sharing! Your welcome!! It is always a crowd pleaser! !